which at first glance made me think PUPPIES was pupples. I read the post below first. Again with the word sale..Why capitalize each letter except for the 'l'.. I beg your pardon. It is four posts down. Well they've also used a lowercase I in "Pit", which is just as unforgivable! Actually, Thor, it's not as bad to use a lowercase i, because you cannot confuse the lowercase i with any other letter. Only the lowercase L is unforgivable when it cannot be distinguished from an uppercase i.
Dotting "i's" incorrectly is a sub-symptom of the same disease. The long, straight thingy is an L because an "i" has a dot. That's what makes this example so precious. Why doesn't "PUPPIES" look like "PUPPLES" to this set of eyes? Agreed, Anon, dotting i's incorrectly is probably a symptom of dysgraphia, but you can never confuse a dotted i for anything else (¡except maybe an upside down exclamation mark! ), just as you could not confuse an uppercase L for anything else ... except maybe an upside down 7. 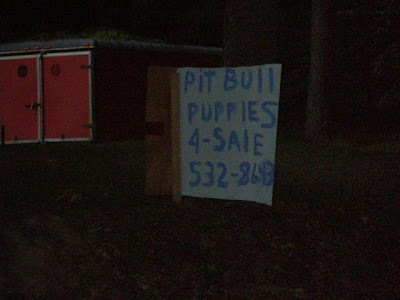 Unless they're the last puppies for sale on D-Day, I'm not buying pitbulls.